Big & Fast Tuna Hunter! This boat is a deep sea fishing machine. Firstly her twin engines (low hours) will give the owner the security to venture well away from the coast. Secondly her 16 rod holders, out riggers and fighting chair will ensure success. She is ideally suited for tuna fishing (remember you need to be licensed). It is equipped with berths so that a night or two at sea will not trouble the crew. She is equipped with standard marine electronics and some sophisticated fish finders. 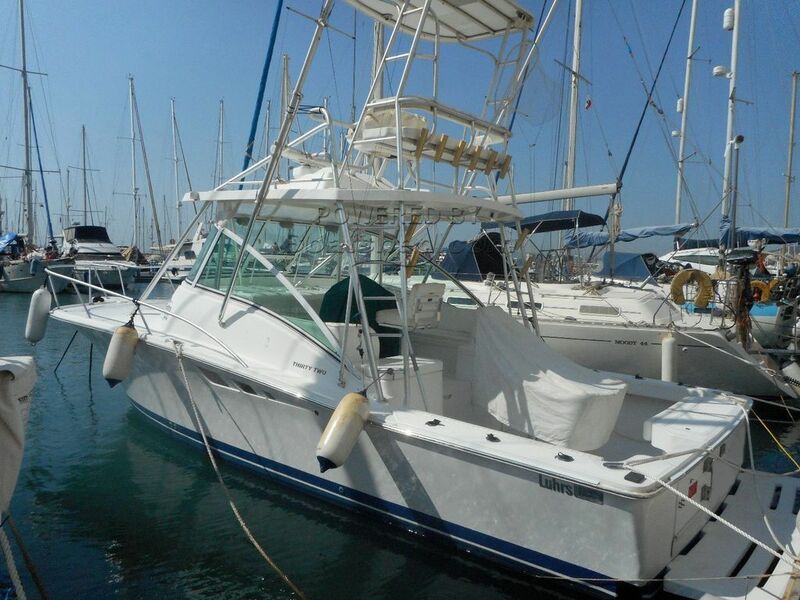 This boat suits a fishing enthusiast or an operator who wants to run charter sports fishing trips. Come and view her before making any decisions. This Luhrs 32 Open has been personally photographed and viewed by John & Lynda of Boatshed Gibraltar. Click here for contact details.